The Plant Kingdom is tremendously diverse. It includes organisms ranging from pond scum to huge trees, moss, lawn grass, flowers, everything in between, and much beyond. All plants need water and carbon dioxide to conduct photosynthesis, making glucose for food and growth. They either have to live in water, where some CO2 is dissolved, or else be exposed to the air with its more abundant CO2 and be specialized in some way to obtain water. The variations displayed by plants permit taxonomists to cluster them in a number of ways. The focus of the Seedless Plants study guide unit is on a selection of plants that do not produce seeds. Here algae (particularly green algae), moss, and ferns are considered in terms of their habitats, body forms, specializations, and patterns of reproduction. An examination of seed-producing plants is reserved for a separate study guide unit. 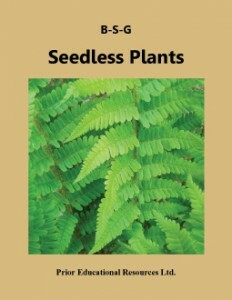 Seedless Plants is excerpted from our Biology 11 Study Guide, which is the fourth edition of a student study guide written to match the curriculum of British Columbia. The concepts presented are applicable to the biology curricula of other educational jurisdictions as well.